Tip: Nearly all canvases cheap or not will be acid free and non-yellowing. They will also most likely be triple primed with titanium white gesso. Thin frame canvases are cheap, easy to buy in bulk and give students and children the experience and the feel of painting on a professional canvas. 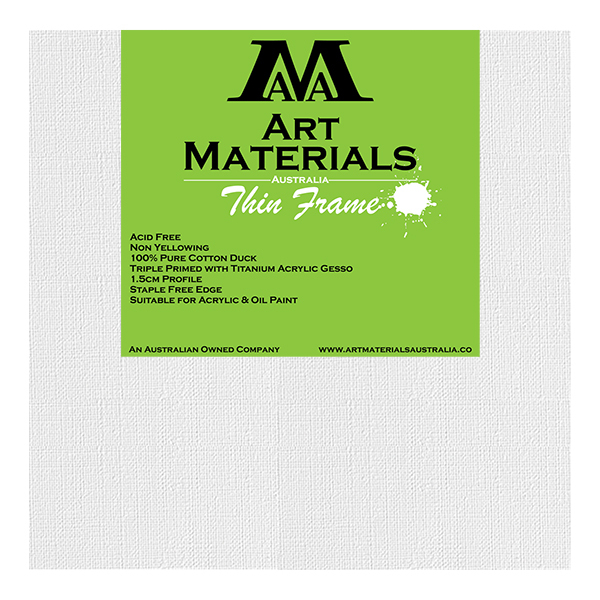 A couple of reasons why thin framed canvases are generally cheap is because of the materials they are made from. More than likely they will be made from a lighter weight cotton duck fabric of around 200gsm and the timber supports in the back, stretcher bars, will be made of a light weight craft type of material. These materials make them cheap to make and cheap to buy. The most popular sizes for thin frame canvases I have found over the years are generally the smaller canvases. These small canvases in bulk are what teachers or organisations usually buy especially the 5x7” or 6x4”. They are small and cheap which usually allows you to get a lot of canvases without going over budget. When using a thin-framed canvas you want to keep them smallish, as they don’t have the support in the frame to go very large. If you do go large you have to be very careful the frame doesn’t twist or warp. Basically if you want to do medium or large canvas and don’t want to frame it with a picture frame then buy a standard 30mm thick profile canvas. Finding the best canvas that will suit your needs is fairly straightforward; I hope I have been able to shed a little bit of extra light on the subject. For more thin famed canvas sizes check out the Artvalli and Paintwell ranges. We love: These packs of paint brushes are cheap, good quality and won't lose their hair!